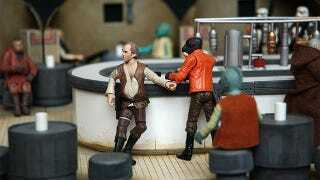 Perfect Recreations Of Star Wars Film Sets. For Your Action Figures. These are not official playsets. They're pieces of art, made by a fan, and are painstakingly-accurate recreations of some of Star Wars' most iconic movie sets, giving his action figures a "realistic" place to stand. Most are from the original Star Wars, though there are a few from TESB and ROTJ as well. They're as perfect as they can be; they can even be adjusted slightly to either make them nicer for viewing, or adhere to the exact layout as seen in the films. Oh, and there's also some Indiana Jones if all this gets you in a Lucasfilm kinda mood. The images below are just a few; there's a ton more shots, and some different locations, at the link.